Automotive metal stamping and fabrication are specialties for the Modineer Team. With innovative technologies, our expert team can design, engineer, manufacture, and achieve quality components regardless of their complexity. We have extensive experience producing high-quality parts for automobiles, heavy vehicles such as on-highway semis, as well as off-highway vehicles that include construction equipment and military vehicles. Of course, our wide range of capabilities mean that we can serve almost any metal forming or fabrication need for automotive OEMs and suppliers. Modineer has years of experience producing tight tolerance automotive metal fabrications in a broad range of materials. This is especially applicable to those metals most often used in the automotive industry such as high-strength, low-alloy (HSLA) steel and aluminum. 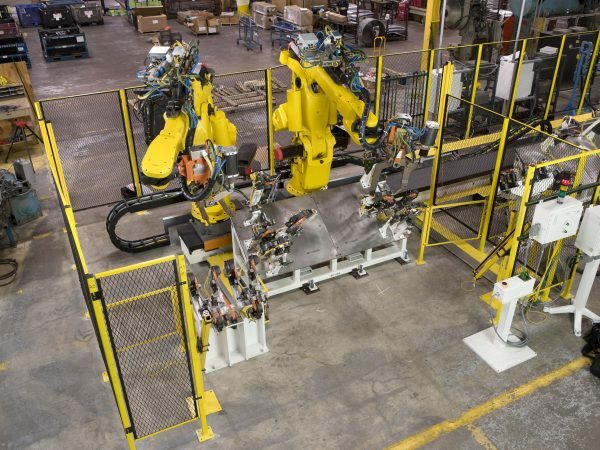 In addition to this, our full range of fabrication capabilities, in combination with manual and robotic welding and assembly, enable us to take your automotive parts project from start to a complete finish. Modineer specializes in bringing complex manufacturing processes together to manufacture components that are ready to assemble. We have partnered directly with OEMs such as GM and Ford as a direct TIER I supplier. Alongside these partnerships, Modineer also works in conjunction with some of our own industries’ largest TIER I suppliers. We provide components for seating, structural sub-systems, convertible roof tops, heavy vehicle, pickup beds, undercarriages, frame components, suspension sub-assemblies, window frames, and many more. Modineer’s capabilities are perfectly suited to the automotive industry. We assist your engineering team with prototyping to ensure that the part meets your specifications. From this stage, we then provide launch support to fulfill long run production. Our program management team provides you with one point of contact, meaning you don’t have to coordinate with multiple suppliers and vendors to see your project to launch. One call to your Modineer program manager will get your questions answered and your project moving forward. Modineer is proudly certified to the automotive industry’s ISO/IATF 16949 quality standards. This certification ensures that your parts are made to their exact specifications. Why Choose Modineer as your automotive supplier?